We understand that it is important to keep the AHT as low as possible while maintaining the superior quality of services. Here are some highly effective tips that we use at our global delivery center for reducing the Average Handling Time. Get The Information First: Our agents are encouraged to gather as much information as possible right at the beginning of the call. This allows our agents to evaluate the whole situation clearly and provide proper solutions to the callers. If the information is not gathered at the beginning then agents would have to get the information filtered through out the call and it will also reduce their performance. Make Team Leaders Available for Agents: We also encourage our team leaders, and even managers, to be available to their agents at all the times. This saves agents from looking into any online resource for help during the call. Show them Examples: The agents who have high AHTs are made to listen to the calls of their colleagues who have low AHTs. The purpose of doing this is to show them how it is done through best possible examples. Reduce the Silence From Calls: We have also observed that many calls have gaps or too much silence in between them. We try to find out agents whose calls have such silence gaps and provide them with proper training so that time consuming gaps could be removed. Agents are Taught the Basics of Call Handling: We try to get the things right from the very beginning. 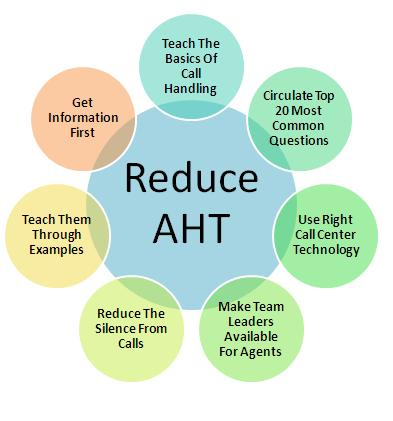 Since the training period agents are taught the basic of handling calls. They are taught to follow the most effective call handling structure which goes like this. The List of Top 20 Most Common Questions: We have created a list of top 20 most common questions which includes those questions which are mostly asked by the customers. This list is circulated among our agents and they are provided with the most suitable answers for each question. This helps them in answering most of the queries without any research or thinking. Moreover, we update this list on a regular basis to ensure that it contains the most relevant questions. Right Call Center Technology: Technology plays a very important role in our lives, whether it is personal or professional. We have invested wisely in the call center technology and have equipped ourselves with the most effective and modern technology. We provide our agents with the best possible technical tools which ease their tasks and reduce the time taken for processing queries. Further, we use highly sophisticated IVR Systems which provide our agents exactly what they require for solving queries. This is how we have succeeded in reducing our Average Handling Time to minimum levels. Further, these strategies also allow us to deliver high quality solutions to customers and have also reduced the call waiting time. If you would like to know something more or want to share your thoughts with us, then please leave us a comment below and we will respond as soon as we can. Posted in Phone answering service.